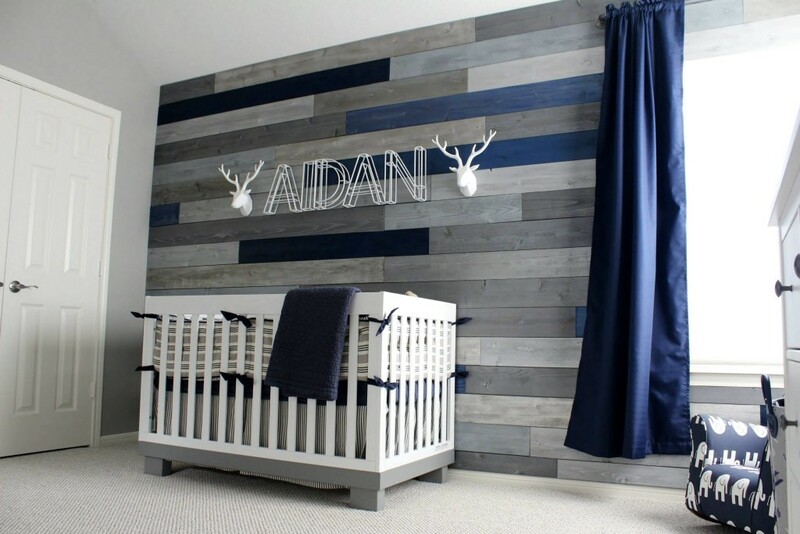 This modern and rustic nursery was a total DIY with touches and accents from bargain stores - done completely on a budget! We are obsessed with the color grey and when we found out we were having a boy, we gravitated to navy as a great pairing color. We also found inspiration through a nursery seen on ProjectNursery.com Once a part of a nursery was completed, the drive to gather things to complement the nursery grew more and more and it simply came together seamlessly. For the nursery, we wanted clean, straight lines, simple and practical. We also wanted to design something that he could grow into as a toddler and a teenager. My favorite item in his room is his name and the lettering. Love the simple and chic look. The outcome of our nursery was due to my extremely handy and talented husband since a lot of it was DIY. But what makes the room are the small details and we were able to get them at discount stores. So be patient and willing to go to several stores to look for the items that will make your room unique and special. It was a lot of fun gathering all the items for his nursery and now we can't wait for him to arrive so he can enjoy it! I love the striped wall. Did you already have the wooden wall and just paint it? Or was it regular drywall somehow made to look like that? I love the room. Where can i buy the wood from? Same colors. I love it. I love this whole room! Can u share the paint colors of the walls and the wood wall colors? Hello- can you please share how you colored the wood planks? Did you use stain? Paint with sanding? And did you use a pine or oak wood? Thanks! Agree with everyone above! I love that wall- please share how it was made and the paint that you used. Is that stain or paint? Would you mid sharing what the colors are and what kind of wood you used? Hey all! So I am not the person who made this wall but I have been playing around with some paints and I have been able to recreate almost all of these colors using standard paint and a rag. Using the rag allowed me to get less “paint” on the wood and the grain was able to show through. Also, I am using about 5 colors but I am going to mix them with different amounts of water to make the color show different shades. I have not really found a gray that gets the almost silvery color, but I plan to experiment soon with a white and gray to see if I can brighten the gray I chose. I will gladly share the paint colors and pictures when I am done if you would like! What type of wood did you use and what colors of stain/paint did you use? What types of stain were used on the back wall? I love the look, but I’m having trouble finding a navy stain that dark. Angela, have you been able to come up worth the colors yet? And are got still willing to share? Is live to know? We measured all the boards different lengths and then sketched out the wall so that we could see that colors were not touching (It was actually so hard to make it look random lol). Then we use a nail gun and just pieced all the boards together. Since this was for a nursery I will say that we did not use reclaimed wood because I just thought about my baby running his hands all over the wall and getting splinters, so we actually went to the hardware store and bought smooth 4 x 12 boards (They were the thin boards but I wanted them to be wide enough that they looked like planks). Do you have any directions for the pipe shelves? Materials list? We like your configuration so it would save time to have a list of what you used. Thanks! Pingback: Nursery Designs – Madison In Stock Flooring at the Right Price! Any ideas where I can get the antler hooks? Love them! Could you let me know where you found that elephant chair. How did you make the clothes rack? Where did you find the antlers? Can you please share the stain and/or paint colors you used got the wall? Hi Taisa, Beth from Project Nursery here. The crib is a Babyletto Modo. It’s linked above. Good luck with your nursery design! So I finished this project a couple months ago but with the new addition to our family I was reminded I wanted to share some comments on this pallet wall. What worked exceptionally well for me was Knotted Pine wood 1x6x8 from Home Depot. You will need to sand it, use a chop saw and a finishing nail gun to get the most out of this look. These are the semi-transparent stains you’ll need from Sherwin Williams. Hi! Would you be able to share details on how you did the name?! I love it!